Try this Frozen Iceberg Wedge Salad with Pistachio-Avocado Dressing on a hot summer day. Serve this side salad with grilled steaks, chicken or grilled kabobs! I know what you are thinking, a frozen salad? Cold salads are so refreshing, and a frozen salad takes this to a whole new level. Try this Frozen Iceberg Wedge Salad with Pistachio-Avocado Dressing on a hot summer day. Serve this side salad with grilled steaks, chicken or kabobs! On a cutting board, slice the head of iceberg lettuce in half, then into 1-2 wedges. Place the lettuce wedges carefully into zip top bags, and place in freezer for at least 1 hour, but no longer than 2 hours (or it will wilt). In a high-speed blender, add the avocado, buttermilk, white wine vinegar, salt, pepper, 1/2 cup pistachios (save other 1/2 cup to garnish), lime juice. Blend until smooth. Place in a small jar, and place in the fridge until ready to serve. 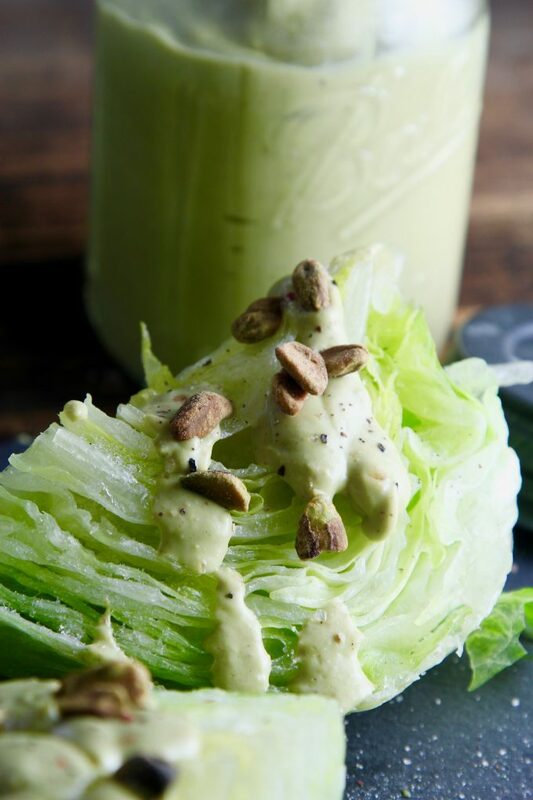 When ready to serve, place each iceberg lettuce wedge on a plate, and drizzle with dressing. Sprinkle with pistachios, and serve right away. So when the temperatures soar, give this salad a try… and tell me it isn’t amazing? The crisp cool lettuce contrasted with the creamy dressing, and crunch of the salty pistachios is extremely delightful. i will try this after the pond thaws. buttermilk, maybe a dollop of sour cream, and add some shaved parmesan. astonishing that parmesan is a very low sodium cheese. it saves me, because all other cheeses are off limits. it has been a challenge to stick to 1/4 tsp salt per day, but have found some interesting work arounds to create good meals. I bookmarked this to try in the summer, but I just couldn’t wait. It is such an easy recipe so I made the dressing ahead and popped the lettuce into the freezer before my friend stopped by and we had it for lunch that day. The combination of the flavors was so satisfying. We just “mmmm-ed” through it. This one is a keeper and I will be making it regularly. Can’t wait to try it on a hot summer day! Thank you!